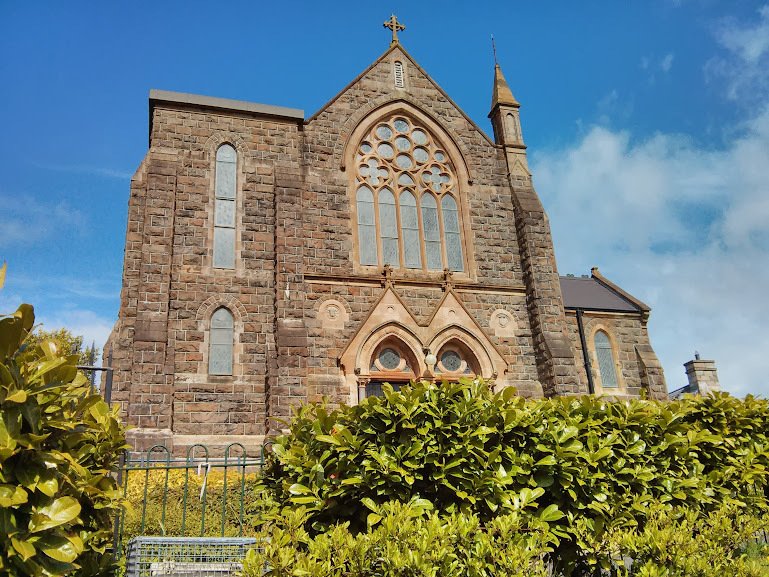 This is the second in a series of geocaches exploring historic Ligoniel- the last of Belfast's mill villages, situated at St. Vincent De Paul Catholic Church, built 1852. Bring tweezers! The historic village of Ligoniel was primarily associated with the bleaching and spinning of flax. It is thought the bleaching of linen initially began in the village in 1770. Ligoniel is situated on Wolf Hill, which so named it is said because this is where the last wolf in Ireland was killed. At one time there were no less than six mills operating in the Ligoniel area alone so it is no wonder that Belfast became known as Linenopolis. Around the year 1850, the villages of Ligoniel and Wolfhill were in St. Patrick's Parish. The parishioners had to walk from this area into the city centre for Mass, no matter the weather! Belfast was expanding a lot in those days. The flax mill was coming to its strength by developing the work force of North Belfast. Within a short while Ligoniel Road was known as Tram Routes 15 and 16 from Castle Junction; Ligoniel was a hive of activity with more owrk than the inhabitants could handle so they bussed people in morning, noon and night. In 1851 the Society of St Vincent de Paul bought a site of a temporary chapel in Ligoniel, and the next year constructed a school at the cost of £370. Thirteen years later, the Bishop of the Diocese had this school building converted to a church, and the Parish of Saint Vincent de Paul was born. If walking here from Ligoniel stroll 1, you will also pass St. Mark's COI, built only 2 years later. The cache - This is a micro cache containing just a log so please bring your own pencil! Please be careful replacing the log in the cache, it needs to be rolled tight. There is a boxing club near the church so be aware of sudden muggle appearance! To complete the full "Ligoniel stroll" series, certain information is required from the location of each cache. If you would like to know what information you will require from this cache site, please scroll down. What number is written on the log sheet surrounded by stars? What are the 8 digits written on the front of the church? Gurer vf n ybg bs zrgny urer, fb vs vg'f n fgbezl qnl, or pnershy lbh qba'g trg fgehpx ol n yvtugvat obyg!